Goodwin College is putting the finishing touches on its Ghanaian Learning Center, set for completion by the beginning of July. Goodwin College Ghana – a new initiative that will see Goodwin open a learning center in the western African capital of Accra – will open in September to its first class of students. The facility will have modern amenities, including reliable Internet service, to connect the students to the College’s online classes. Enrollment is underway for Business Administration, the first Goodwin College program offered through the Ghana initiative. Goodwin is seeking to provide education opportunities to residents in Ghana, home to one of Africa’s fastest growing economies. 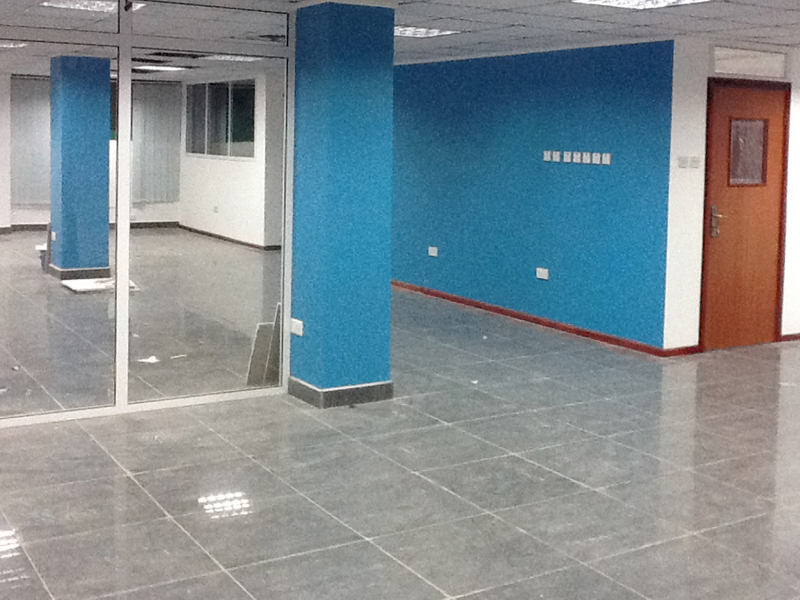 The Student Lounge in the newly renovated Goodwin College Ghana. Kwabena Tandoh, Executive Director of Goodwin College Ghana, said the facility will be 500 square meters, or about 5,400 square feet. Classrooms will be fully air conditioned and every desk will be equipped with computers with direct Internet connection. Unlike many other classrooms in Ghana, Tandoh said, the rooms are limited to sizes of no more than 20 students and are equipped with video-conferencing technology. Enrolled students will have access to the College’s library services and online catalogs, journals, and data. Interpersonal services include tutoring, technology assistance, and mentoring. Goodwin College Ghana is located in the Dzorwulu section of Accra, the largest city in the country. Though roughly 5,000 miles away from Goodwin’s River Campus in East Hartford, students at the Learning Center will have success coaches and resources on par with their American counterparts, and will study the same curriculum. For more information, visit www.goodwin.edu/ghana. Like us on our brand new Facebook page, https://www.facebook.com/GoodwinCollegeGhana, and on follow us on Twitter, https://twitter.com/GoodwinGhana. EAST HARTFORD – Goodwin College’s room dedication to Capital Studio Architects, LLC holds significant meaning to the College and Goodwin President Mark Scheinberg. On Wednesday, June 19, Goodwin dedicated classroom 213 to Capital Studio in recognition of a $25,000 gift. The contribution of $25,000 will help the Foundation to provide scholarship opportunities and other services to Goodwin College students. 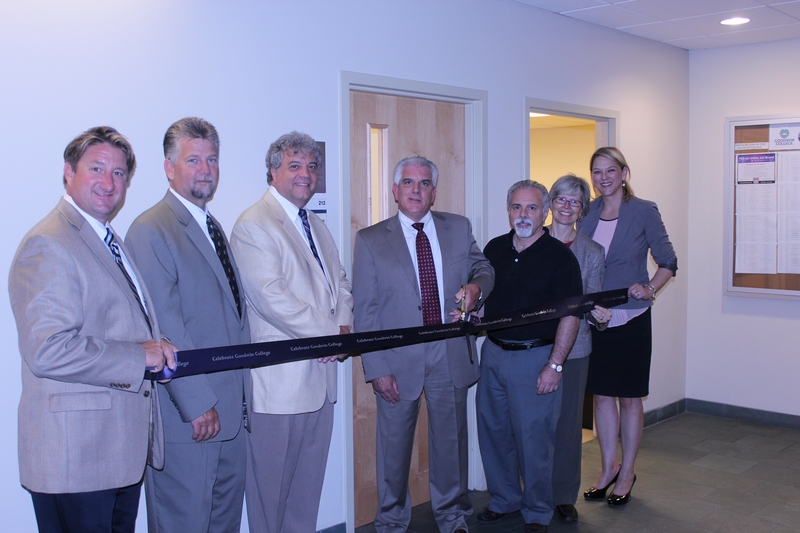 Goodwin College dedicated classroom 213 to Capital Studio Architects, LLC on Wednesday, June 19. Pictured from left to right: Goodwin Vice President of Economic and Strategic Development Todd Andrews, Goodwin Vice President of Physical Facilities and Information Technology Bryant Harrell, Goodwin President Mark Scheinberg, Capital Studio Architects, LLC Partners David Holmes and Pat Mancuso, Goodwin Director of Advancement Holly Winters and Goodwin Vice President of Advancement Brooke Penders. The East-Hartford based architectural firm has been instrumental in the development, planning, and execution of the various Goodwin construction sites, including Goodwin College itself. Goodwin has built a strong relationship and partnership with Capital Studio over the many years they have worked together. With award-winning experience in Historic Preservation / Adaptive Reuse projects, Capital Studio provides architectural planning, interior design and code compliance services to clients throughout Connecticut. David Holmes and Pat Mancuso, partners at Capital Studio, were in attendance as Goodwin graciously accepted this gift. “We can’t thank you enough for this opportunity and we hope we left our mark. It has been a pleasure to work with Goodwin College and I am grateful that Mark is my friend. I hope to do this for many more years,” said David Holmes. Even though Capital Studio is so often behind the scenes, President Scheinberg acknowledged that they have played a large role at Goodwin College. “We are standing in the brain child of Capital Studio. You can’t drive up any street in East Hartford without finding the Capital Studio’s touch. It is a real heartfelt pleasure to have Pat and David here. They maintained our vision and we are able to put boots on the ground because of them,” said Scheinberg. Get ready for movies under the stars as Goodwin College presents the first of three films in a series of summer outdoor movies, all free of charge to the public. Goodwin College invites you and your family to come and recapture the magic of Monsters, Inc.
On Friday, June 28, the Goodwin Summer Movie Series kicks off with Monsters, Inc., the 2001 Disney-Pixar family favorite. All are welcome to join the College at One Riverside Drive for the event, which will take place on an oversized screen set on the College’s main quad area. Guests are encouraged to bring a blanket or chair and grab some space on the grass. The movie will begin at 8:30 p.m. Vendors will be on hand selling food and other goodies. There is no charge for admission and families are welcome. Guests visiting campus for the first time should map GPS to 211 Riverside Drive, East Hartford. Monsters, Inc. is the animated tale of two monsters, James Sullivan and Mike Wazowski, who specialize in extracting screams from children, which is converted into energy in the strange world of Monstropolis. Chaos ensues when a young girl finds her way into the monster world and throws everyone for the loop. 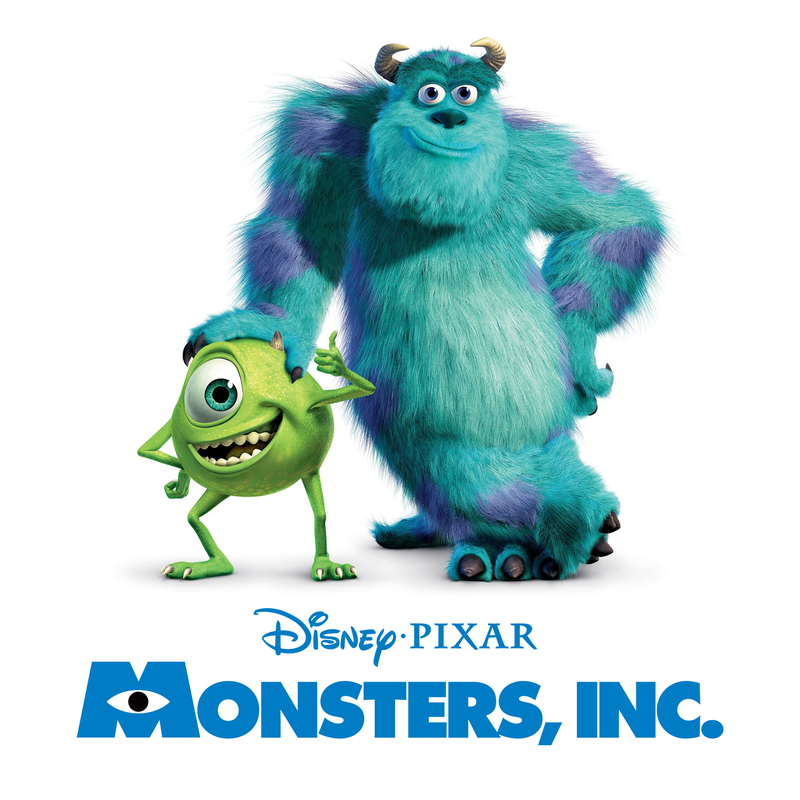 Featuring the voice talents of John Goodman, Billy Crystal, and Steve Buscemi, the film was hugely successful and spawned a prequel, Monsters University, which begins playing in theaters nationwide on Friday, June 21. Goodwin invites all to rekindle the magic of the original Monsters, Inc., one of the most beloved films in the Disney-Pixar canon. The fun continues on Friday, July 19, when the College hosts a screening of the musical favorite, Grease. Come in costume and sing along as Danny and Sandy kindle some romance amid all the teen drama at Rydell High. The film stars John Travolta and Olivia Newton-John and features one of the most memorable soundtracks in movie history. The film series is sponsored by the College’s Community Engagement Committee. The 28 students who made up the first graduating class of the Connecticut River Academy endured plenty of changes and transitions during their time on campus. Taylor Wiggins of Windsor flashes a smile as she prepares to graduate from the Connecticut River Academy. As evident at their graduation ceremony held Monday, the students are emerging from their experiences bonded as a family. 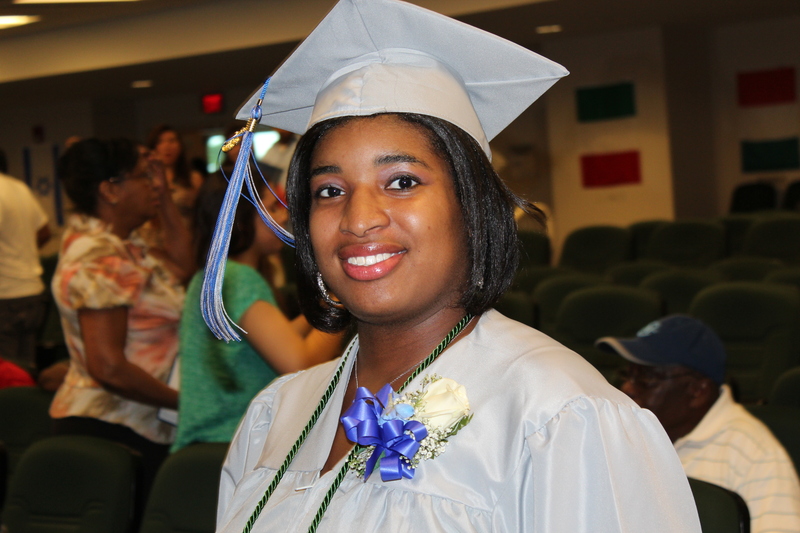 “We knew things might not go as planned, but we never gave up,” said graduate Ebony Kelly of East Hartford, Vice President of the Academy’s Class of 2013. 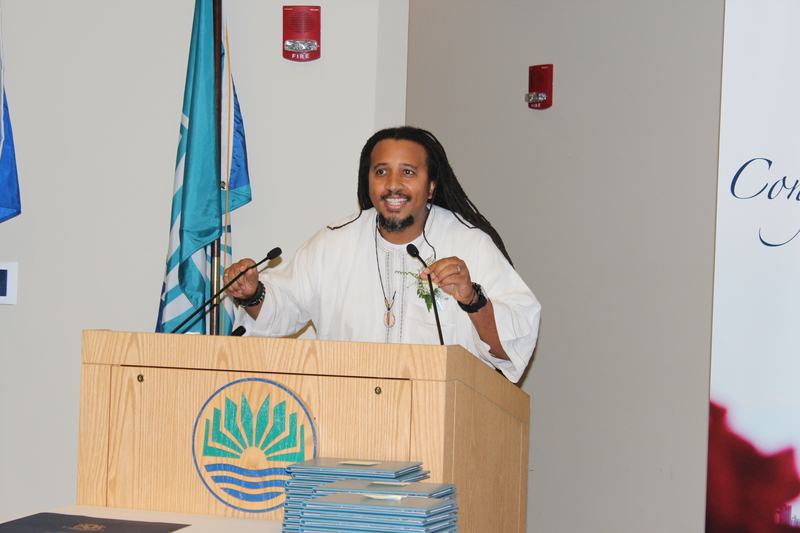 The Academy, which opened on Goodwin College’s River Campus in 2010, celebrated its graduates with an emotional ceremony. Family members filled the Goodwin Auditorium as the students reflected on their time at the Academy, as well as what lies ahead for them. Austin Shelton of Tolland shakes hands with Connecticut River Academy Principal Linda Dodona. taking the chance at attending a brand new school that would be unlike any they had previously experienced. Principal Linda Dadona quoted Martin Luther King, reiterating something she told the students on their first day of Orientation in the summer of 2010. Goodwin College opened the Academy to ninth and tenth graders, drawing from school districts throughout the state. It was the College’s first magnet school, and while construction is ongoing rapidly on a permanent Connecticut River Academy, both the building and the concept were a work in progress. Goodwin President Mark Scheinberg told the grads that their friendships will carry them far. “There’s magic in the people sitting around you that will last your entire lifetime,” Scheinberg said. Ebony Kelly of East Hartford and Ashley Bracken of Windsor Locks await the start of Commencement. The Academy has a curriculum centered on environmental science, utilizing its namesake river as a resource as well as the College itself. More than half of the grads took Goodwin courses, earning transferable college credits. Some even qualified for the Goodwin Dean’s and President’s Lists or had their work published in College media, such as The Beacon, the Goodwin literary magazine. Enrollment at the Academy is climbing steadily, and once the school moves to its home further down Riverside Drive, up to 480 students may attend. The first class, however, was a very small one, which the students found to be a real blessing. “Never forget that you have a bunch of people by your side who want to see you soar some more, including your classmates,” said Class President Kristen Alvarez, of Hartford. Since the entire class was like an extended family, Alvarez shared her good wishes and memories of each of her classmates, individually reflecting on their talents and aspirations. She saved some strong praise for her mother, Alvarez’s “Superwoman,” for the sacrifices she made to help her daughter succeed. All the graduates are seeking further education or training upon leaving the Academy. Goodwin Board of Trustees Chair Maria Ellis also sent them on their way with the full blessing of the College. “Anything you need going forward, you’re always part of the Goodwin family,” Ellis said. Commencement speaker Calvin Terrell previously worked with the Academy students and developed friendships with the grads and the faculty alike. Though based in Phoenix, he travels the country speaking to schools and inspiring learners of all ages to overcome educational inequality. Terrell urged the students to be “instruments of peace,” to be steadfast, and to confront the challenges that generations past may have avoided or sidestepped. “I look forward to seeing you on the path as peaceful warriors,” Terrell said. Dadona told her grads that they had helped shape the future of the Connecticut River Academy and she wished them the best as they make the best of their own journeys. To see more photos, check out our Flickr album. Dr. Sherrilyn Bernier has profoundly affected her students with her support and encouragement while attending Goodwin. In recognition, the student body cast their votes and Human Services professor, Dr. Sherrilyn Bernier, has been announced as the recipient of this prestigious award. The Make a Difference Award is given to a faculty or staff member who has positively impacted Goodwin College students and who has made the most difference in their lives. Currently an Assistant Professor at Goodwin College and an adjunct at the University of Hartford, the University of St. Joseph, and St. Vincent’s College, Bernier has an obvious passion for teaching and has made a difference in the lives of many. Bernier includes self-esteem building in her teaching not only in one’s self but in the future clients they will be working with in the human services field. “I completely understand the students at Goodwin. I want to give them the encouragement to continue. My goal is to build their confidence and self-esteem no matter what I’m teaching. The most important goal for me at Goodwin is that my students succeed,” Bernier stated. Bernier has worked in the human services, healthcare, and social services field for over 20 years. She started out at Tunxis Community College and continued her education at Central Connecticut State University where she received a Bachelor’s in Sociology with a minor in Psychology in 1998 and a Master’s in Counseling with a specialty in Community Rehab in 2001. In 2006, Bernier received a Doctorate in Educational Leadership from the University of Hartford. Bernier is very involved in the Goodwin community. She was elected Vice President for the New England Organization for Human Services and is a member of the Academic Affairs Committee, chair of a sub-committee on the Facilities and Technology Committee, and secretary for the Faculty Senate. I had attended colleges before Goodwin College, right after high school and when I moved to Florida, but never received my bachelor’s degree. I always loved being around and volunteering with children and knew that I wanted to make my passion a reality so I came to Goodwin to pursue my education in Early Childhood Education and Child Study. My husband was very supportive of me going back to school and continued to be throughout my entire time at Goodwin even while we had a baby on the way. While attending Goodwin, I worked full time and took three night classes a week, hybrid, online, and on-ground courses. All of my teachers understood that their students had lives outside the classroom – family obligations, job responsibilities, etc. and worked with us and our schedules. Goodwin helped me to land a wonderful internship where I worked at an Early Care and Education Center with young children from infants to Kindergarteners. I couldn’t have asked for a better internship experience and Goodwin really prepared me for that. I am now a lead teacher at the Early Care and Education Center I interned at. I love the parent and children interaction on a daily basis and that I can be a resource and not just a teacher. My boss is amazing and extremely supportive of my education, family and career. What I love the most about my job is that every day is a new day and that keeps me going. I make a difference in the children’s lives and they make a huge difference in mine. Nearly three dozen Connecticut River Academy at Goodwin College students from across Greater Hartford earned boating safety certification by passing a rigorous U.S. Coast Guard test. The students took part in a program through the school, with assistance from members of the Coast Guard Auxiliary led by W. David Marriott, Division Commander, 125 ISR. Science teacher Jennifer Reilly taught the Water Stewardship course, in which the students spent ten weeks preparing for the exam. They learned skills including chart reading, rules of the road, safe operating practices, and marine regulations. In addition, following the Connecticut River Academy’s Environmental Studies theme, they explored the environmental impacts of personal and community boating activities. “This course is an excellent representation of the opportunities and experiences our environmental studies magnet high school can offer to students.” said Michele Saulis, the environmental theme coach. The Connecticut River Academy will celebrate a tremendous achievement as Goodwin College’s interdistrict magnet high school holds its first-ever Commencement Ceremony on Monday, June 17. 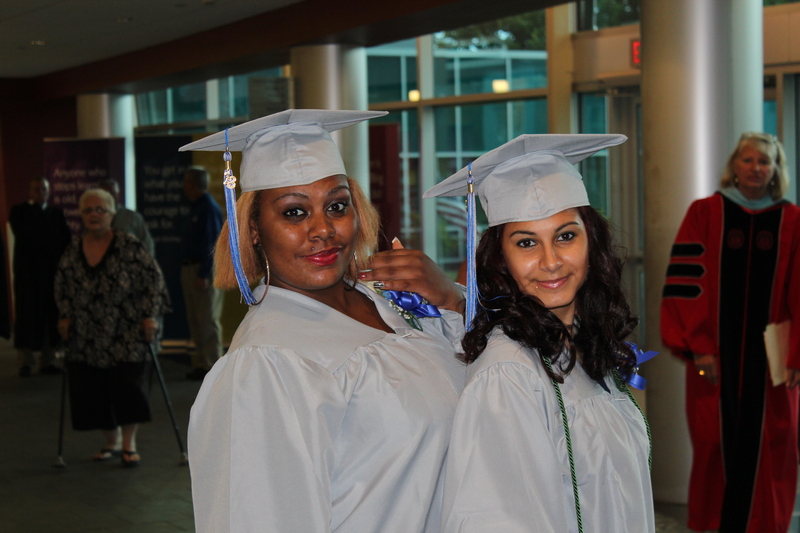 The Academy will hold Commencement at 6 p.m. in the Goodwin College Auditorium, One Riverside Drive, East Hartford. Visitors should set their GPS to map to 211 Riverside Drive. Speakers include Connecticut River Academy students and leaders from both the high school and Goodwin College, as well as LEARN, the education center that manages and oversees instruction. Calvin Terrell, an educator and nationally recognized speaker, will give a keynote address. The first graduating class of 2013 consists of 28 students and is a very tight-knit group. The Academy draws students from dozens of towns in the Hartford region and beyond. The Commencement Ceremony will be a milestone for both the Academy and the College. The Academy opened to sophomores and freshmen in 2010 in incubator space on the Goodwin campus. Three years later, enrollment has jumped at the school, and that first class of sophomore students is prepared to graduate. Located on the Goodwin College River Campus, the Academy draws on the resource of the Connecticut River to enrich curriculum. Nearly half of the senior class is dually enrolled at Goodwin, where Connecticut River Academy students are eligible to take up to two courses per session, free of charge. Credits are transferrable to the next level of higher education, and many of the students plan to enroll at Goodwin College. The Academy students have thrived in the College environment, where many of them have qualified for status on the Goodwin President’s and Dean’s Lists. 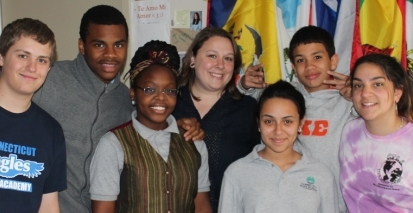 Spanish teacher Lindsay Smolka embodies what it means to be a leader and a mentor to the students at the Connecticut River Academy at Goodwin College. Highly respected by students and teachers alike, Smolka is very involved at the magnet high school in East Hartford. Lindsay Smolka (center) with some of her Connecticut River Academy students. “The students love her. She is just a phenomenal teacher and is always willing to help out and do whatever it takes to make our school successful,” said Timothy Kessler, Vice Principal of the Connecticut River Academy. Smolka emphasizes building relationships and teaching life before content. Down-to-earth, straightforward, and kind, it’s easy to see how Smolka is able to build strong relationships with her students. The Connecticut River Academy serves students from over 25 towns across Connecticut and works to prepare its diverse student body for further educational opportunities. The faculty and staff at CTRA work to create a school climate conducive to learning with the promotion of positive behavior. Smolka, who obtained her Bachelor’s degree in Spanish and Political Science from Central Connecticut State University, went on to achieve her Master’s degree in Secondary Education. After spending a year teaching at East Hartford High School she was given the opportunity to help open the Connecticut River Academy Magnet School. 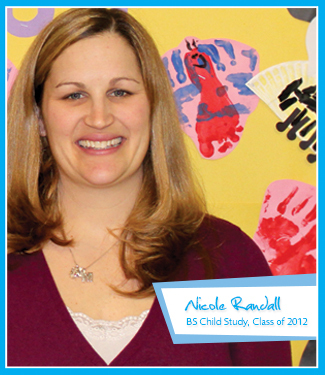 “I was looking for a school that had a diverse population, technology, and a large focus on post-secondary education. CTRA offered all of those things,” Smolka said. Smolka recalled wanting to pursue a teaching degree because she hoped to be like some of her former teachers. 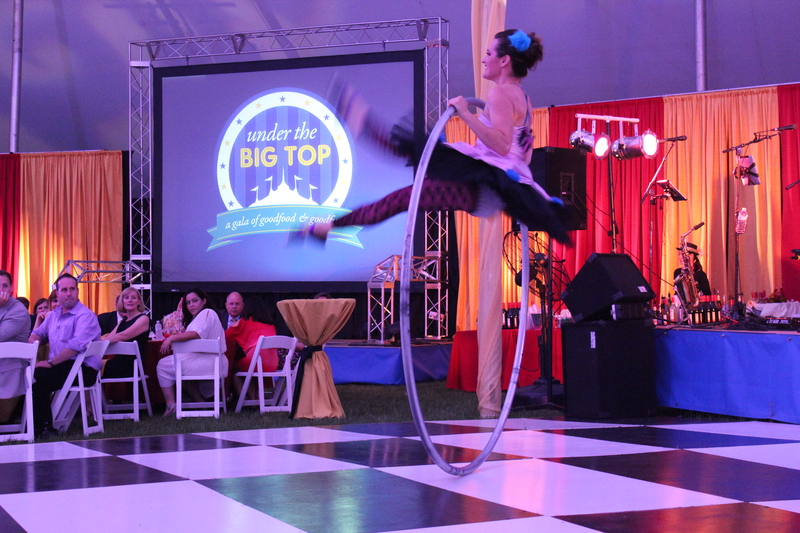 A performer shows off her hula hoop skills during the College’s “Under the Big Top” Gala. A festive evening “Under the Big Top” has yielded a huge success for the Goodwin College Foundation, with critical funds raised for student scholarships. On Friday, May 31, Goodwin hosted over 350 people for a night that lived up to its billing of good food and fun. 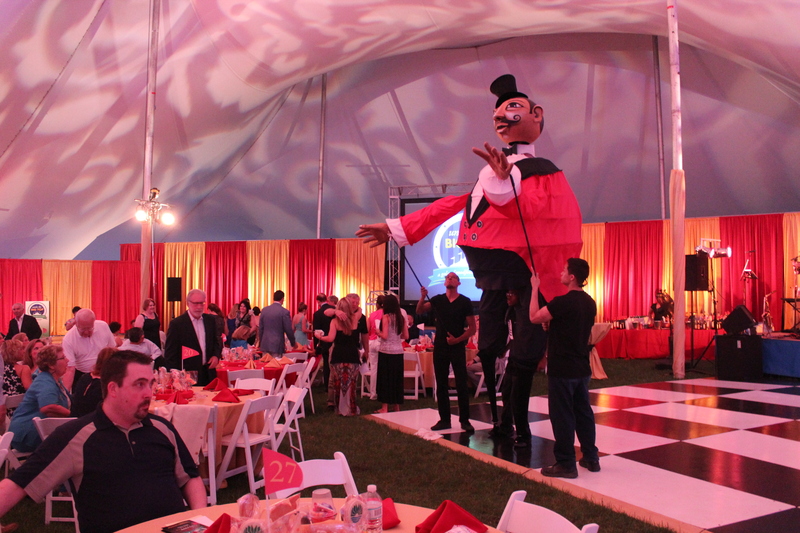 The College’s first ever gala celebration featured circus-themed entertainment and a gourmet midway of cuisine ranging from unique to traditional. Stilt walkers, Hula hoop dancers, and jugglers made their way through the crowd, along with Bert, a giant puppet ringmaster designed by puppeteer and artist Ann Cubberly. 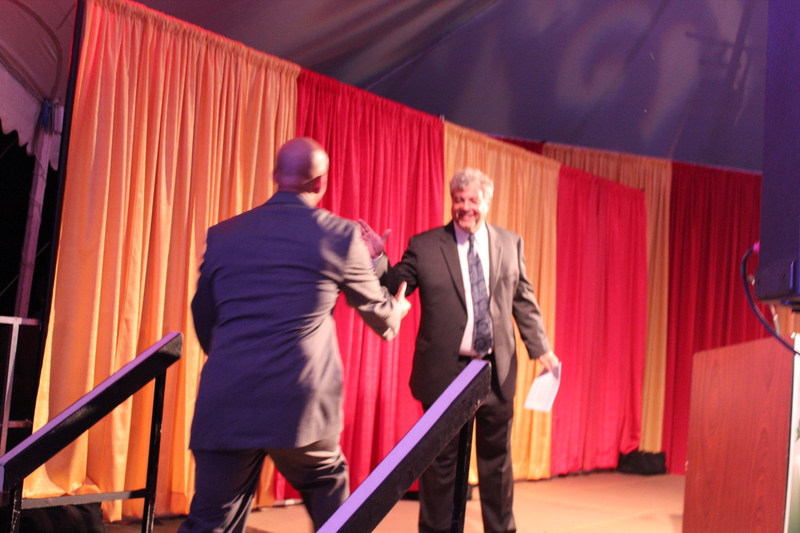 Dinner and dancing took place under the same tent where Goodwin College held its 2013 Commencement Ceremony on June 6. A number of notable guests attended, including Governor Dannel Malloy, U.S. Senator Richard Blumenthal, Congressman John Larson, and East Hartford Mayor Marcia Leclerc. Gov. 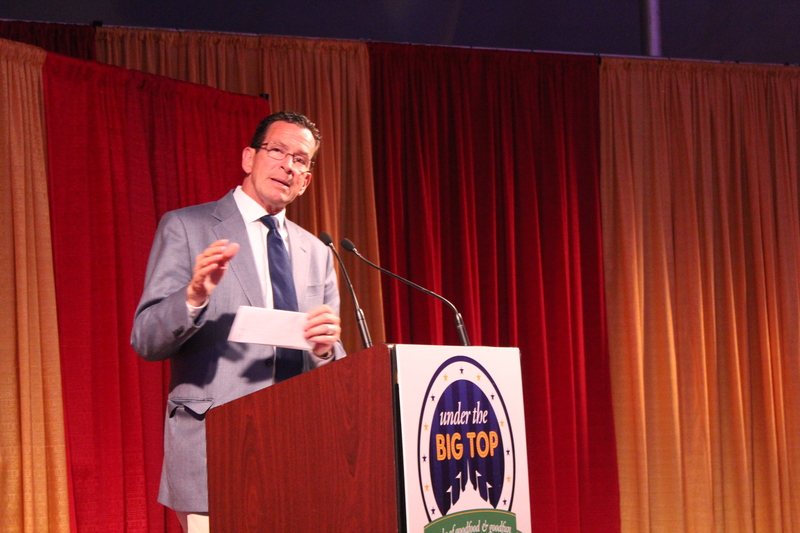 Dannel Malloy addresses the Gala audience. was proud of Connecticut’s private colleges, which along with the public university system, are contributing greatly to the state. Sen. Blumenthal praised the College’s mission and the positive impact that Goodwin has had on the lives of its students. “Goodwin is a great American example of entrepreneurship and doing good,” said the Senator. Pratt & Whitney, an East Hartford institution and neighbor of Goodwin College, served as the main sponsor for the evening. In addition to helping fund the event, Pratt & Whitney gifted the College $10,000 to benefit the Goodwin College Foundation, which manages Goodwin’s endowment and provides scholarship opportunities to students. “Bert” the puppet served as Master of Ceremony. The Pond House, with a contribution by its partner and Goodwin College Foundation Board Member Russ Weldon, also gave $10,000 to the Foundation at the event. Fox Connecticut personality and meteorologist Joe Furey ran a live auction, with packages including an African photo safari and a “Windy City” getaway that included VIP Chicago White Sox tickets. Other items auctioned included a catered dinner with Goodwin President Mark Scheinberg, gourmet cooking lessons, and more. Additionally, a silent auction contributed to the evening’s fundraising success of over $60,000. 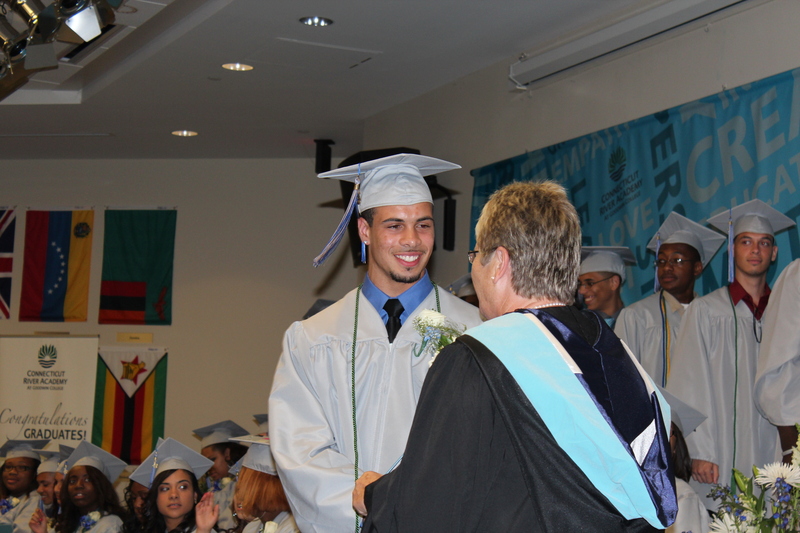 The scholarships are critical to the many students who receive aid to attend Goodwin College, the fastest growing nonprofit institute of higher education in Connecticut. One of those students spoke of his own unique road to Goodwin and how the College has helped him progress through the Nursing Program. Goodwin President Mark Scheinberg welcomes Nursing student David Mifflin to the stage. For more pictures of the Gala, visit our Flickr page.